HOMECOMING thankfully skips the already twice-depicted-on-film story of how Peter Parker (Tom Holland) became Spider-Man, and instead picks up where we left the webslinger at the end of CAPTAIN AMERICA: CIVIL WAR. He’s just helped Tony Stark/Iron Man (Robert Downey Jr., natch) in his conflict with Captain America, and now thinks he’s ready for the super hero big leagues. For Stark, though, Peter is largely an afterthought as he moves on to other projects and priorities. He leaves Peter with the fancy new suit he was given in CIVIL WAR, and assigns his personal assistant Happy Hogan (Jon Favreu) to keep an eye on the kid. It’s a job Hogan doesn’t take all that seriously, as he’s in the midst of moving all the various high-tech gadgetry from Avengers Tower to the team’s new HQ. Determined to prove that he’s ready to be an Avenger, Spidey heads out to fight crime in his neighborhood with the best of intentions, but not always with the best results. Eventually, he stumbles across a group of criminals selling weapons made from tech left over from the aliens in THE AVENGERS and the deactivated androids of AVENGERS: AGE OF ULTRON. The leader of the crime ring is The Vulture/Adrian Toomes (Michael Keaton). Toomes was originally hired to clean up the mess left behind in AVENGERS, and had even bought extra trucks and supplies for the job. However, he was kicked off the job site in favor of a special crew called Damage Control, a company owned by Tony Stark. Toomes feels as if he’s been screwed over by Stark and other rich fat cats, and selling the stolen villain tech is his way of getting his fair share. Toomes also has a few notable crew members: Phineaus Mason aka “The Tinkerer” (not sure they actually call him that in the movie, played by Michael Chernus), and trusted muscle Herman Schultz (Bokeem Woodbine), who becomes the second and most effective of Toomes’ henchman to take up the weaponry and moniker of Shocker. There’s also plenty going on in Peter’s personal life, which he has difficulty juggling with his would-be heroics. He still manages to do good in school, but his extracurricular activities as part of an academic decathlon team suffer. Peter also accidentally reveals his secret identity to his best friend Ned (Jacab Batalon, playing a character obviously inspired by the best friend of Marvel’s other Spider-Man, Miles Morales). Peter also has two potential romantic interests: the popular leader of the decathlon team Liz (Laura Harrier), and quiet but acerbic when she does talk team member Michelle aka “MJ” (Zendaya). Marisa Tomei is also on hand as Peter’s Aunt May, but doesn’t really do much. That’s an awful lot of plot and characters to keep straight. As a result, there’s a certain amount of clunkiness to the proceedings, though not as bad in that regard as, say, BATMAN V. SUPERMAN. It still hardly flows, though. And some of it could easily have been eliminated by getting rid of most, if not all, of the Tony Stark/Iron Man stuff. I know part of HOMECOMING’s mandate was to fully integrate Spider-Man into the Marvel Cinematic Universe, but that’s already done via the Vulture selling alien tech and the brief recap of Spidey’s involvement in CIVIL WAR early in the film. It’s not as if Downey is a co-star or anything, but there’s still too much of him and Favreau. And that brings us to another of my gripes: the Spidey suit Stark gives to Peter. As it turns out, it’s not just a suit. It’s an overly complicated gadget complete with a talking AI. Why does a guy who already has super human strength, web shooters, can stick to walls, and knows when danger is nearby thanks to his “spider sense” need this? It’s just a dumb plot device that adds more clutter to the film. Let me be clear. I don’t hate SPIDER-MAN: HOMECOMING. 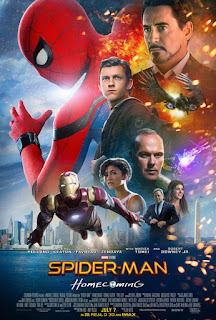 It has a winning cast, with Holland in particular doing a great job bringing Peter/Spidey to life. There’s humor and action and fun, and as some who liked the movie more than me have pointed out, it’s atypical to see a film like this where the hero has to really work at learning how to be super. But there are also a lot of overly familiar plot elements. As much as Keaton’s performance is one of the highlights of the film, his character’s arc feels way too much like Willem DaFoe’s Green Goblin in the first Toby Maguire SPIDER MAN film. Making him more working class gives it a bit of a twist, but the similarities still stick out to me. And man am I tired of superhero movies where the hero is completely incapable of keeping his or her secret identity secret. Why even bother wearing a mask? And just on a basic cinematic level, this movie really does feel like product to me. The best way I can describe John Watts directions is “capable”. That’s not an insult. The guy managed to take the helm of a multi-million dollar franchise and not screw the pooch. No easy task, that. But it doesn’t feel as if Watts has done anything but be a good company man here. He certainly didn’t put his stamp on the material the way Sam Raimi did with his Spider trilogy, or even Marc Webb with his two web-slinging entries. Ditto for the six-headed beast that wrote the screenplay. The varioius writers managed to hammer out something that fit the needs of Marvel as a company and is a reasonably entertaining story, but it just doesn’t feel necessary to me. Clearly many critics and viewers disagree, so take my review how you will. I’m certainly not trying to dissuade anyone from seeing HOMECOMING if they’re in the mood for a Spider-man movie. I just can’t get join in with everyone else giving it full-throated praise. 2 ½ out of 4 stars.